As the holiday season approaches, PHR will take a look at what teams are thankful for as the season heads past the one-quarter mark. There also might be a few things your team would like down the road. 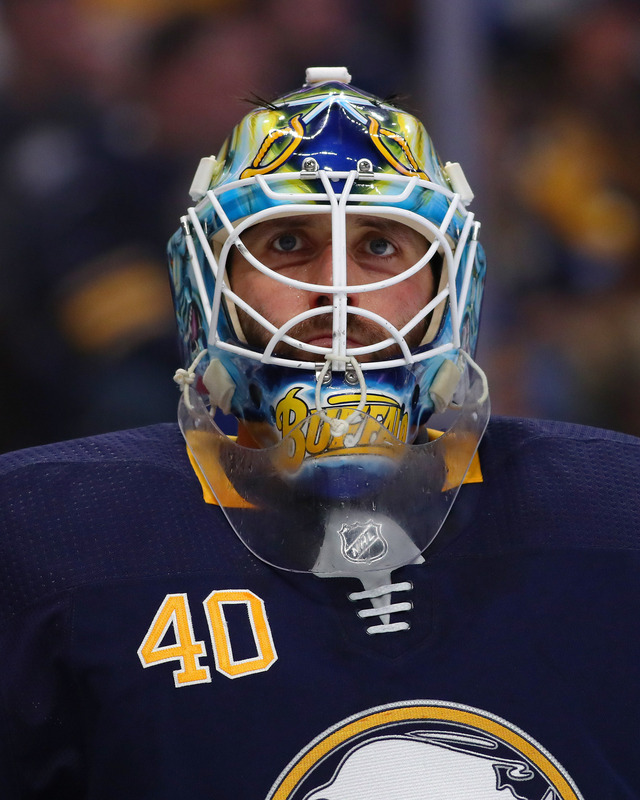 Let’s take a look at what’s gone well in the early going and what could improve as the season rolls on for the Buffalo Sabres. What are the Sabres most thankful for? Can Sabres’ fans be any more thankful for the fact that the team, the same team that finished last in the standings one season ago, is currently in first place in the entire NHL with 34 points. That may be short lived as several teams just beneath them play before the Sabres go for their 10th straight win on Tuesday, but few could have predicted the success for second-year general manager Jason Botterill and head coach Phil Housley this season. The Sabres shook up their entire roster from a year ago and made critical additions at every level, which included adding Jeff Skinner to their top line on offense, adding a number of solid players to their depth chart including Vladimir Sobotka, Patrik Berglund, Casey Mittelstadt, Conor Sheary and Tage Thompson, while adding 2018 first-overall pick Rasmus Dahlin (who has been as good as advertised) on defense. That doesn’t include the team’s success in goal. Those moves have stabilized the team’s defense as they ranked sixth in the league in goals against this year as well as having one of the best penalty killing units in the league as well. Who are the Sabres most thankful for? While it would make sense to put Skinner and his 18 goals in this spot, we can save him for later. The tandem that has really impressed this year has been the play of the Sabres goaltenders Carter Hutton and Linus Ullmark. The team, which struggled a year ago with Robin Lehner and Chad Johnson has thrived this year. Much of that could be the improvement of the team’s defense, but at the same time both goalies have been better than anyone had expected. While Hutton was the top goaltender on the market this offseason, most people felt that Hutton was not capable of being a No. 1 goaltender, often comparing him to Carolina’s Scott Darling. However, Hutton has been better than advertised, already netting 11 wins and posting a solid 2.53 GAA and a .919 save percentage in 18 appearances. The untested Ullmark also has looked good, although the team has been careful to not overwhelm the 25-year-old. However in five appearances, he’s also posted a 2.52 GAA and an even more impressive .926 save percentage. What would the Sabres be even more thankful for? More production from their youth. The team is very young and is loaded with talent at the AHL level as well. And while players like Dahlin have been impressive, the team could take another step in the right direction if they can develop some of their young core even quicker. Dahlin has played well sharing No. 1 defenseman duties with Rasmus Ristolainen, but he’s capable of even more. The team has gotten just four goals from Mittelstadt and would like to see him develop into a consistent presence in the top six at some point. Others like Thompson, who has suddenly starting showing off some offense with three goals in his last four games, as well as Evan Rodrigues need to continue to develop as well to allow the team to reach peak efficiency both now and in the future. The team is also loaded with a number of prospects including defensemen Lawrence Pilut and Brendan Guhle, while they have several potential options at forward as well in C.J. Smith, Daniel O’Regan and Alexander Nylander waiting for an opportunity. What should be on the Sabres’ Holiday Wish List? The team has made it clear they intend to work on an extension with Skinner next month, but the team really needs to make sure it can lock down the 26-year-old who leads the team in scoring this year and is only six goals away from beating his 24 goals from last season with Carolina. Skinner’s deal will be the main contract the team must deal with this offseason as the team has just three unrestricted free agents (Jason Pominville and Matt Moulson being the others). Skinner’s pairing with Jack Eichel has produced a powerful top line in the NHL and should only get better as the two continue to get comfortable with each other. With the expiring contracts of Moulson and Pominville, although the team may want to attempt to retain the latter, there should be plenty of money to lock up Skinner now, so they won’t have to worry about him losing him this summer. 5:24 PM: The Penguins have indeed finalized a deal with Sheahan, announcing that he has signed a one-year, $2.1MM contract. It checks in at a slightly higher amount than his $2.075MM qualifying offer but had he been qualified and gone to an arbitration hearing, it likely would have cost more for Pittsburgh to keep him around. 2:04 PM: Though he wasn’t qualified earlier this week, Riley Sheahan is likely headed back to the Pittsburgh Penguins anyway. GM Jim Rutherford took questions after his trade of Conor Sheary earlier today, and indicated that the team was getting closer to a deal with Sheahan and would have re-signed the 26-year old center even without the added cap space. The team also admitted that their focus is on adding another defenseman before the season begins—something they have apparently done already with Jack Johnson. The Penguins didn’t give Sheahan a qualifying offer because it would have cost them more than $2MM, and he would have gained arbitration rights. Now, though Sheahan could technically become an unrestricted free agent and sign with whoever he wants on July 1st, the team seems confident they can get a deal done at a lower cap hit. That’s important to Pittsburgh, who are pinching pennies to get everyone in under the $79.5MM ceiling. Sheahan can be a useful player for the team, able to line up at center or wing and contribute offensively in a secondary role. Coming off his incredibly unlucky 2016-17 campaign—Sheahan took 106 shots before getting his first goal of the season in the final game, ending with just two—he bounced back to register 32 points despite being used almost exclusively in a defensive role. Sheahan received the fewest offensive zone starts of any center on the team, and was asked to kill more time shorthanded than anyone other player on a per-game basis. Even with increased roles coming for players like Daniel Sprong and Dominik Simon, Sheahan has clear value to the Penguins. He’ll be back in the fold in some capacity, though it’s not clear where a contract would land with the former Red Wing. With the relatively thin center market you’d think that he could draw some interest from around the league, but perhaps the stability that a Cup contender like Pittsburgh brings is enough to convince him to not even test the open waters. The Pittsburgh Penguins made it clear after re-signing Bryan Rust that there may be cap casualties this summer, and we now may have an idea of who GM Jim Rutherford was talking about. Conor Sheary and Matt Hunwick are headed to Buffalo in exchange for a conditional 2019 fourth-round pick. The pick would move to a third-round selection if Sheary scores 20 goals or 40 points, or if Hunwick is traded before the 2019 draft. With no salary retained, this move clears $5.25MM for the Penguins, giving them plenty of room to add through free agency if they so choose. Conor has proven himself to be a reliable forward with an ability to come through in big games, whose playoff experience speaks for itself. Conor and Matt will bring a winning pedigree to our team, and we expect them both to complement our group very well. Sheary is the prize of the trade for the Sabres—if you couldn’t tell from the above statement—and will likely be asked to take up residence on the left side of one of the top two lines in Buffalo. He has experience playing with a superstar center before, spending plenty of time on Sidney Crosby’s wing in Pittsburgh. If he can recreate some of that chemistry with Jack Eichel, the Sabres may have finally found a fit for their franchise center. The 25-year old Sheary went undrafted as a junior player and needed to prove himself at the NCAA level before being offered a professional contract. Even then it took several years of development to get to the NHL, a path that Botterill will be quite familiar with given he was an assistant GM of the Penguins and ran their minor league system at the time. If there is anyone around the league that knows more than Rutherford about Sheary, it’s Botterill. That said, Sheary did have just 30 points last season and has proven to be an extremely streaky scoring threat. There are times where all his hard work and speed result in very little, as we saw in the playoffs when he was held to just two assists through 12 games. Buffalo will hope a return to playing with skilled forwards will jump start that offensive touch, and get him back to the 23-goal man he was in 2016-17. Hunwick had already worn out his welcome in Pittsburgh, just a single year into the three-year $6.75MM deal he signed last summer. There was never any bad blood between the veteran defenseman and the coaching staff or organization, but he couldn’t find a fit in the lineup and ended up playing in just 42 games. Getting rid of his contract was key this offseason, now that Jamie Oleksiak has taken his role at the bottom of the defensive corps and the team could be interested in bringing in players like Jack Johnson. Should Johnson still be a target for the Penguins, they certainly have enough space now to fit him in. With the reputation Rutherford has for trading though, it seems just as likely that Pittsburgh will be involved in talks for players like Jeff Skinner, Max Pacioretty or Artemi Panarin, all three of whom are heading into the final year of their current contracts. Whether the price tag on any of them would interest the Penguins isn’t clear, but they now have the cap room—over $10MM in fact—to make a much bigger splash. For Buffalo, adding two roster players for a conditional mid-round draft pick is nothing short of brilliance by Botterill. The Sabres aren’t in salary cap trouble and can easily afford to take a swing on both. 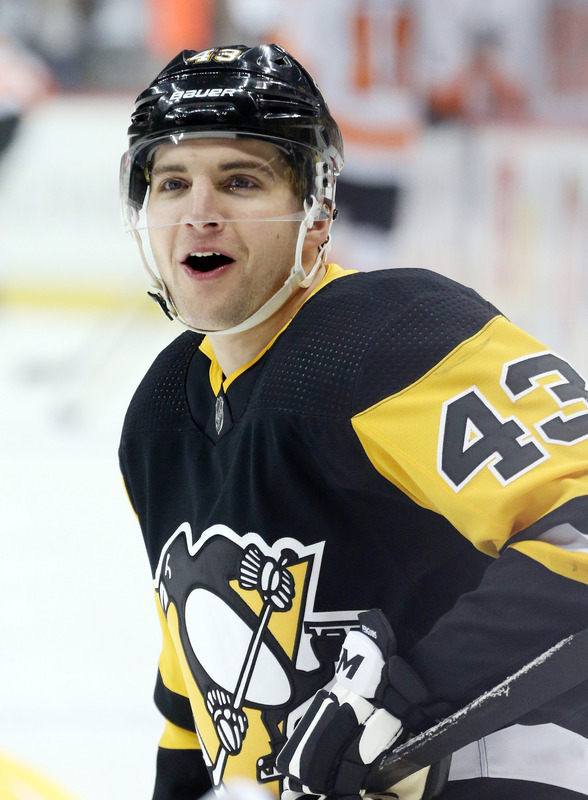 Sheary provides a high reward player who could blossom in Buffalo, while Hunwick represents an upgrade on some of the defensemen the team iced last season. Even though the 33-year old didn’t fit into the Pittsburgh system, doesn’t mean he can’t be a useful sixth or seventh defenseman for the Sabres going forward. Elliotte Friedman of Sportsnet first tweeted that there were “rumblings” of a trade between the Penguins and Buffalo Sabres surrounding Conor Sheary. Darren Dreger of TSN reports gave us the Hunwick addition and the conditions of the trade. Josh Yohe of The Athletic has some of the best sources inside the Pittsburgh Penguins, and in a piece (subscription required) detailing the potential availability of Phil Kessel this summer—something Yohe confirms is possible, though takes the Arizona Coyotes out of the running for financial reasons—he reports some of the players made available in GM Jim Rutherford’s recent pursuit of Max Domi. The Penguins were willing to talk about Bryan Rust, Conor Sheary and Dominik Simon, though what the exact offer for Domi was is unclear. The Coyotes would eventually trade Domi to the Montreal Canadiens instead for Alex Galchenyuk. Rutherford is known as an executive willing to trade, and there has been no denying that he’d like to improve his club. As soon as Domi was rumored to be available many reports linked him to the Penguins, but it was never clear what kind of value the team would put on him. Now it’s clear, as all three of the mentioned players are important pieces to the Pittsburgh attack. Rust may be the most interesting name, after a 38-point season that saw him become one of the most versatile and effective forwards on the roster. Contributing on the powerplay and penalty kill while putting up some of the team’s best possession numbers, Rust is a perfect fit for a club that wants to spread offense across three lines. He can play both wings and has bounced between several groups over the last two seasons. He also is 26 and a restricted free agent however, meaning he’s due for a raise and is closing in on UFA status. After earning an average of $640K in each of the last two seasons, he’ll cost the Penguins a lot more this time around. Any multi-year deal is buying out unrestricted free agent years, and should send his cap hit skyrocketing despite his pedestrian goal totals. Sheary on the other hand is already signed for two more seasons at a $3MM cap hit, but could be replaceable for the team if they can find offense somewhere else. The 25-year old saw his ice time drop to under 14 minutes a night this season and without anything to offer on the penalty kill his role is limited to an offensive presence. That point production dropped significantly from the 2016-17 season, and while Sheary still scored 18 goals this year he recorded just 30 points. Simon lands somewhere else on the value chart, as he’s both a restricted free agent this summer and hasn’t yet shown he can handle the NHL on a full-time basis. The 23-year old was good this year in his 33-game stint, scoring 12 points and recording solid possession numbers, but with just 38 NHL games under his belt since being drafted in 2015 it’s not clear yet what he can really become. When presented with the choice of these players or Galchenyuk, it makes sense that Arizona would take Montreal’s offer. We don’t know though how the negotiations took place exactly, and instead can only take from this report that the Penguins would be willing to move each of the three for the right return. While that’s not very surprising given their GM’s propensity for trade, it gives us an idea of what to expect from Pittsburgh in the coming weeks.